American made and American owned, American Cruise Lines proudly sails its small ships on 23 different itineraries along the inland waterways and rivers of 28 of the United States. Building their own vessels that sleep from 50 to 200 passengers allows Chairman and CEO Charles A. Robertson to maintain the quality of personal service that fuels the company’s enviable reputation. With a 40% repeat passenger rate, a “World’s Leading Small Ship Cruise” honor from the World Travel Awards and, according to Robertson, the highest per passenger net yield in the cruise industry, they must be doing something right. As I discovered at a recent press lunch aboard the Independence, staying ahead of their guests’ expectations is American Cruise Lines recipe for success. Cruising as a family vacation has exploded in popularity, with parents discovering that the one-price-includes-almost-everything rate, free childcare and varied onboard activities make for a relaxing and affordable adventure. Add in seeing new destinations — even foreign countries – every day, without the stress of changing hotels or packing, and the family cruise vacation makes perfect sense. 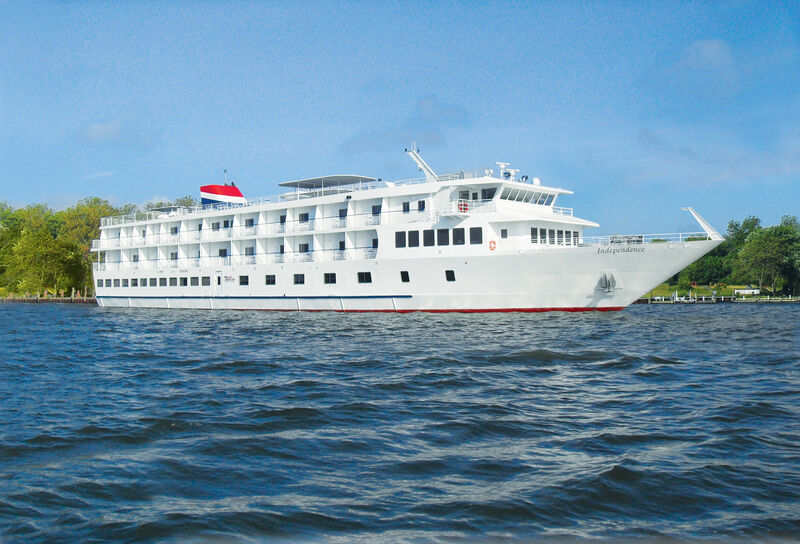 While most families think about 5,000-passenger ships with skating rinks and movie theaters for their next vacation, grandparents and parents sailing with teens and young adult children have other, very different options – a river cruise or small ship cruise to unusual ports of call which cannot accommodate the big vessels. in America has become the new road trip, albeit one without hassles like driving, cheap motels, and bad road food. The quality and personal attention delivered by American Cruise Lines attracts its own audience to river cruising and some unusual Alaska itineraries. Largely baby boomers and seniors, many ACL fans book back-to-back cruises and stay aboard for weeks at a time. They demand active, engaging vacations to destinations they want to see, and they know what they want to see when they get there. That ACL has an all-American crew on these American flagged ships adds a certain mystique that also attracts foreigners interested in seeing the “real” America. Grandparents looking for the perfect multigenerational vacation will find this a good option, given its small size that is conducive to bonding. Themed itineraries cover the Civil War, Wine Trails of Washington State, Southern Music and Lewis & Clark’s Expedition among many choices. Each cruise has guided shore excursions and, often, evening lectures making them especially educational in a fun way, too. The Independence is so intimate that passengers easily make friends for life, by connecting with those who share a common passion. As the official vessel of The Smithsonian, National Trust for Historic Preservation, and the Alumni Clubs of Stamford and Harvard, the ship’s small library is stocked with books pertaining the region being visited. If someone in the family wants to play golf at the next port of call and someone else wants to visit the local museum, it is easily arranged. There is a rooftop deck with a few treadmills and a tiny putting green, but no workout facilities. The cuisine, which executive chef Tom Leonard described to us as “simple but elegant” is locally sourced wherever possible, and menus change to reflect the ship’s destination. 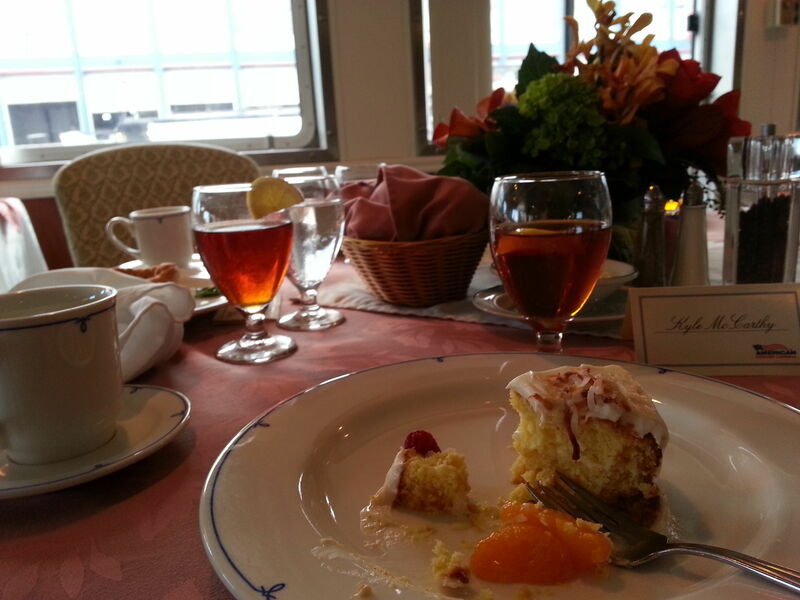 Meals are served in a dining room that can accommodate the entire passenger load in one seating. The pleasant bar and lounge doubles as an entertainment venue if musicians are onboard, a lecture hall,, or a bridge tournament room during the day. In addition to handicap accessible rooms, there is elevator access to all decks and a custom-built launch that looks like an amphibious vehicle whose special ramp exit allows the mobility impaired to participate in shore excursions. Here’s a Vine Video of my ship’s tour. Having visited the Independence, one of American Cruise Lines newest vessels, I can see the pro’s and con’s for family vacationers. Cabins are relatively large, comfortably furnished, and all but the ones on the main deck have their own verandahs. Some ships are configured so that up to three cabins can be connected with balcony partitions removed, ideal for multigenerational vacations. Each vessel has a number of single cabins for relatives traveling alone. When younger children are onboard, the attentive crew will arrange special activities and shore excursions to engage them. Meals are open seating in one main dining room but times are somewhat flexible. Allergy, gluten-averse and even Kosher diets can be accommodated. Room service is available at breakfast, there are DVD’s to borrow for in-room movies and whether it’s afternoon or not, there is coffee and tea, snacks and soft drinks available in the lounge. According to Robertson, grandparents usually foot the bill for the entire clan, which can number 15 to 20 people. Given that there are fewer than 200 people onboard, that can make for tight quarters unless you have a close-knit family. However, with itineraries that stick close to the East Coast, or ride the current of the Mississippi and other rivers, Robertson estimates that most passengers will spend 75% of their cruise vacation on dry land. Enjoying the many ports of call can give family members some alone or ‘me’ time. Such attention to detail doesn’t come cheap. Robertson carefully says that his passengers may pay four to five times what a passenger on, for example, a Carnival megaship, would pay. This line does not discount, either, but it does offer a 15% reduction to those who book their next cruise while onboard – something more than 20% of passengers do. Robertson also proudly notes that his sons (three handsome Robertson boys are in the company’s management team) came up with the very popular idea of offering a free cruise to anyone who had cruised with American Cruise Lines 10 times before. Other than a few shoulder season departures, Robertson notes that his six ships (three more on the way) are usually sold out. One of the most popular itineraries is along the Mississippi – the company owns two large paddle-wheelers — especially the scenic eight-day route (from $4195 per person) from St. Paul to St. Louis past the forested shores and mountains of Wisconsin and Minnesota. History buffs love the Lewis & Clark route along the Columbia and Snake Rivers (eight days from $3750.) Robertson himself suggests the eight-day Historic South & Golden Isles itinerary (from $3750) calling at Charleston, Beaufort, Savannah and Amelia Island along the Atlantic. Note that starting rates are per person based on double occupancy in main deck cabins without verandahs. Rates include meals and non-alcoholic beverages (you can request a refrigerator for your cabin), snacks, activities but not shore excursions (except in Alaska), lectures and onboard naturalist programs. For 2014, expect a new division, Pearl Seas Cruises, to begin sailing to Canada and eventually to South America where many more great rivers are waiting to be explored. For bookings and more information, call their agents at 800/814-6680 or explore the American Cruise Lines website. And please share your at sea experiences in our Comments section below.